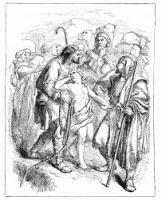 Even Jacob did not realize how bitter had grown the dislike and resentment of his older sons toward Joseph. 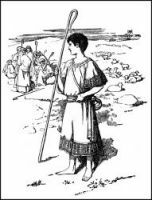 The ten older brothers were feeding their flocks far to the north, and Jacob asked Joseph to go and make sure all was well with them and then to report back. Joseph set forth, and when the brothers saw him approaching from afar, they conspired to slay him. However, the eldest of Joseph's brothers, Reuben, could not stomach the idea of murdering Joseph, so he proposed that instead of shedding blood, they should lower Joseph into one of the wells scattered about the plain, and leave him there to die a bloodless death. In secret, Reuben meant to return and rescue Joseph. The other brothers agreed to this plan, and the unsuspecting lad was lowered into the pit. Their plan changed again when another brother, Judah, who was too kind-hearted to commit murder, convince the others that it would be to their benefit to sell Joseph into slavery. And so he was he was sold to a caravan of traveling merchants, Ishmaelites, who were passing by. These Joseph Bible illustrations are from my collection of antique postcards. Feel free to use these Joseph Bible pictures in your art projects. 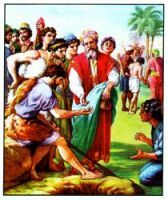 Click on the drawings of Joseph in the Bible below to see more details about saving a free Joseph Bible image or about purchasing the images of Joseph from the Bible at a higher resolution.